The below article is a contribution from the editors at men’s online fashion store Mr Porter in collaboration with aBlogtoWatch. 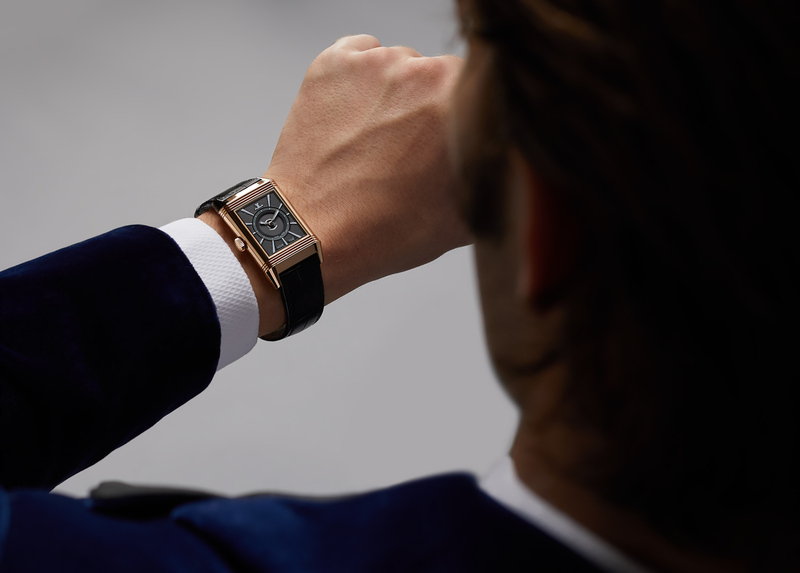 The goal was to demonstrate how to style a Jaeger-LeCoultre Reverso watch with formal men’s evening attire along with some important history and context of the clothing items themselves. We think that this is how to talk about clothing and watches. The aBlogtoWatch editors further agree that the iconic Reverso makes for an apt evening watch for men – but what do you wear with it? 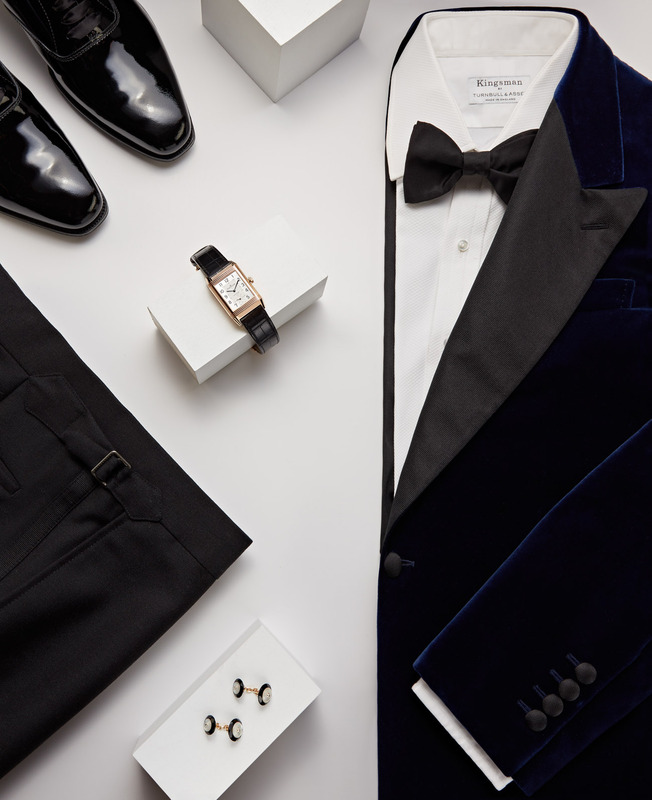 Mr Porter features some of the products available in their store to showcase how to pair a Jaeger-LeCoultre Reverso timepiece with stylish evening wear for men. 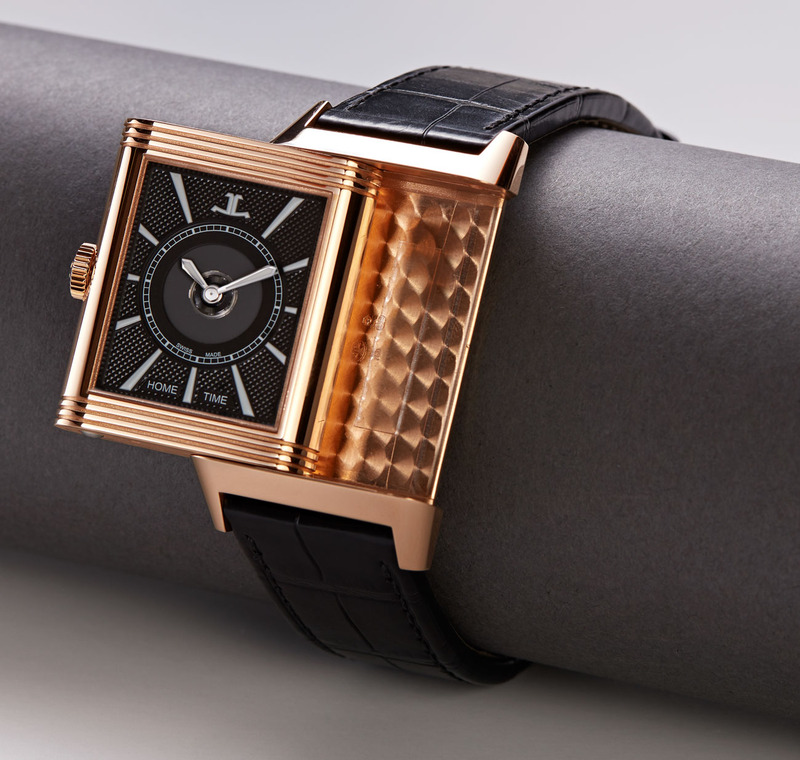 The specific Reverso watch chosen for this fashion exercise is the Jaeger-LeCoultre reference 3832420 Reverso Classic Large Duoface in 18k pink gold. It contains the in-house made Jaeger-LeCoultre caliber 969 automatic movement which actually has two dials for the time. 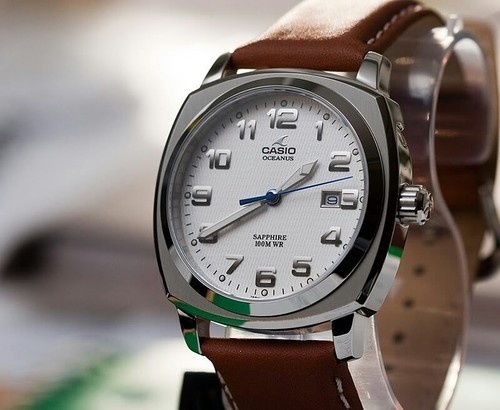 The wearer can flip over (“reverse”) the case while it is worn on the wrist in order to reveal the other side. The “day” side of the Reverso Duoface is in a silver color with a guilloche motif in the center of the dial. 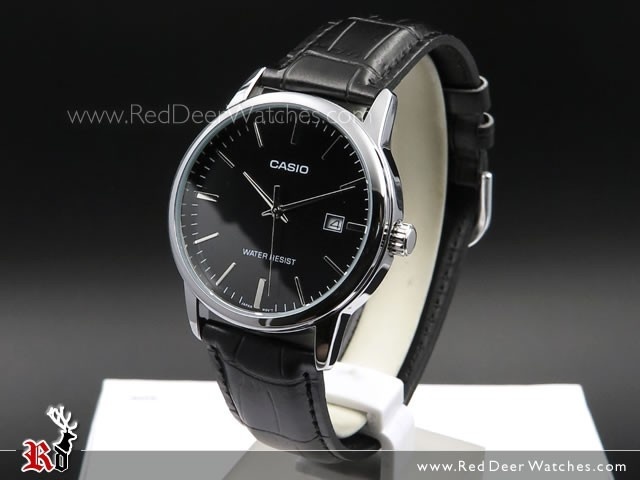 This face features the time with hours and minutes as well as an AM/PM indicator. The other side of the watch is the “night” face in black with its own distinctive design featuring only the time – and that can be set independently from the time on the other dial serving as a reference for a second time zone. 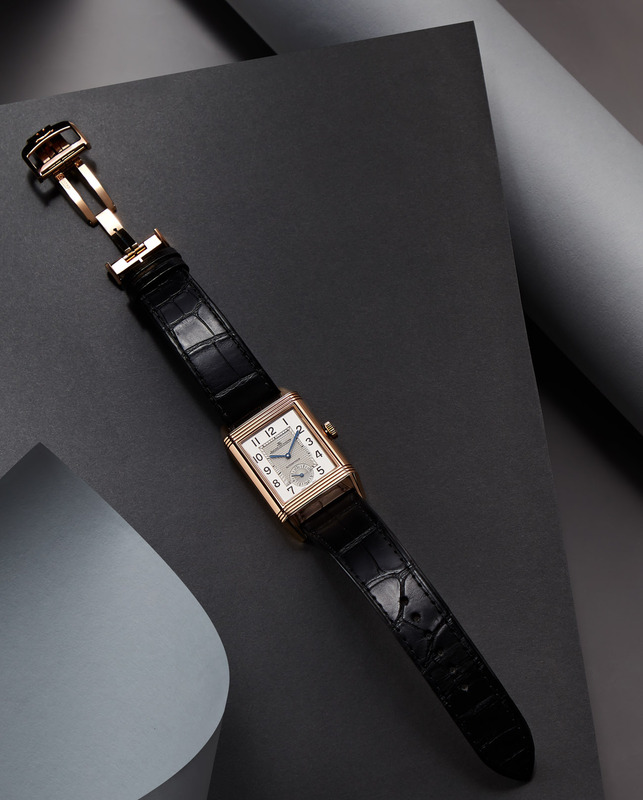 The Reverso Classic Large Duoface is 28.3mm wide by 47mm long and 10.3mm thick. That gives it a modest, dressy size which works elegantly with formal attire. As its name suggests, this Art Deco-era design is almost 100 years old and continues to be both timeless and fashionably versatile. 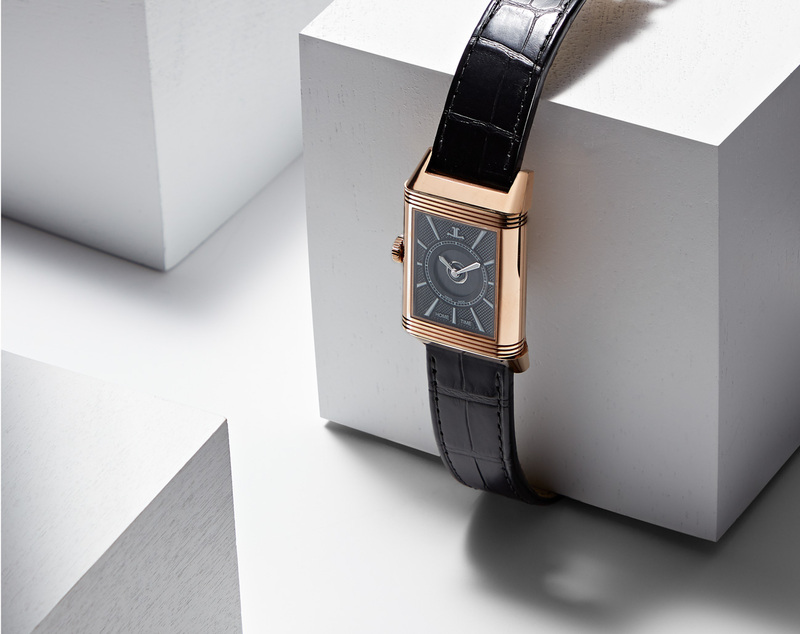 Since its early days as a watch intended for use on the polo field Jaeger-LeCoultre’s iconic Reverso has performed something of a volte-face, if you’ll pardon the pun, and is now considered one of the quintessential square-faced dress watches for men. As with any dress watch, there’s no better place for it to be seen than peeking out of the cuff of a dress shirt. Not just any dress shirt, though. Or any tuxedo, for that matter. If you’re splashing out on a serious dress watch, you owe it to yourself to invest in some proper evening wear to match. Evening wear is an area of a man’s wardrobe that’s often overlooked. Frankly, it’s easy to see why. Most guys won’t wear a black tie more than a handful of times in any given year; why spend good money on something that’s going to see such infrequent use? This is wrong-headed logic, though, for a couple of reasons. Firstly, a proper tuxedo is an investment in style. It doesn’t date like a piece of designer fashion, so even if you only wear it twice or three times a year, you’re still going to get a lot of use out of it in the long term. Take good care of it, and there’s no reason why you shouldn’t still be wearing it in a decade or more. Secondly, it’s the nature, rather than the number, of these occasions that matters most. Opportunities to get dressed up to the nines may not come around very often, but that’s precisely what makes them so special. These are the moments when you really ought to look your best. As Ian Fleming once said, “A gentleman’s choice of timepiece says as much about him as does his Savile Row suit”. The reverse statement is also true. If you’re the kind of person who appreciates a proper watch, it’s likely that you also understand the importance of proper evening wear. Imagine investing several thousand of your hard-earned dollars in a Jaeger-LeCoultre Reverso – one of the finest dress watches a man can own – and pairing it with an ill-fitting rental tuxedo. You might as well go the whole hog and wear a Casio. We’ve chosen a ‘Mayfair’ tuxedo shirt from Hackett, the highly esteemed London brand from menswear authority Mr. Jeremy Hackett. Mayfair, of course, is the well-heeled district of Central London from where the tuxedo originated. In 1865, the future King Edward VII ordered a dark blue silk jacket from his tailors, Henry Poole & Co. of Savile Row. The garment soon became popular on the other side of the Atlantic, eventually taking its name from Tuxedo Park, a wealthy area of upstate New York. The shirt is paneled with piqué cotton on the bib and cuffs, cut for a slim fit and has an exposed placket for decorative shirt studs. In other words, it’s everything your go-to dress shirt should be. Ensure that it’s well-pressed, paying special attention to the front and cuffs, as these are the areas that will be visible when wearing a tuxedo jacket. It’s also worth noting that a neatly folded double cuff will also complement the sharp lines of the Reverso’s rectangular case. 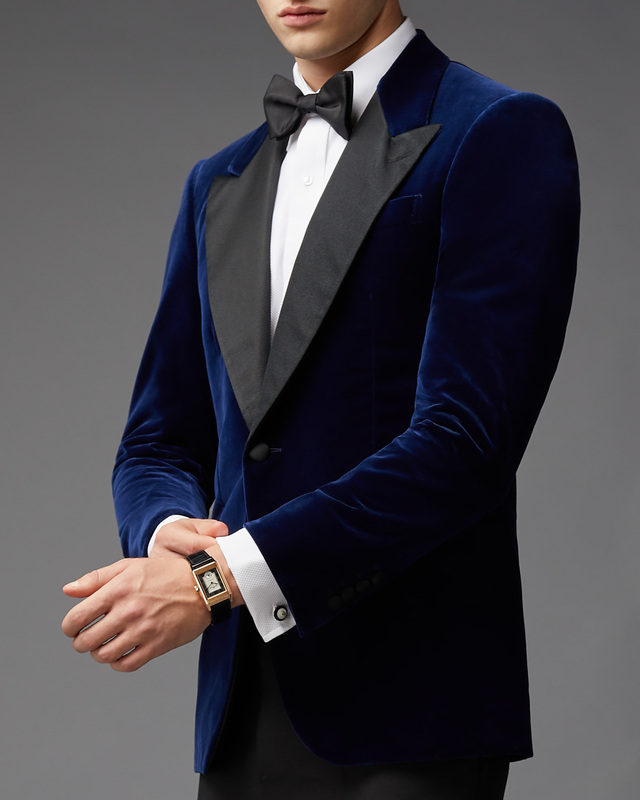 The star of the show is a midnight-blue velvet tuxedo jacket from Kingsman, a menswear line designed by MR PORTER in collaboration with Arlene Phillips, the Oscar-winning costume director of the spy movie franchise of the same name. This is no ordinary movie tie-in. The accessories are produced in collaboration with some of Britain’s most respected brands, such as Smythson, Cutler and Gross, Hunter and Swaine Adeney Brigg, while the suits are expertly made in Italy. The jacket we’ve chosen here is tailored for a strong, masculine silhouette: notice how the broad satin lapels accentuate the shoulders while the suppressed waist elongates the torso. Midnight blue is a smart choice for black tie, being both far enough from black to create an interesting visual contrast and close enough to stay well within the boundaries of traditional evening wear. When the dress code calls for black tie, it pays to be respectful – but not religiously so. The point is not to achieve a sort of sartorial homogeneity, whereby everybody in the room looks exactly the same. Modern evening wear is an increasingly diverse stylistic genre, with a number of widely accepted alternatives to black, not to mention a range of textures with which to experiment. 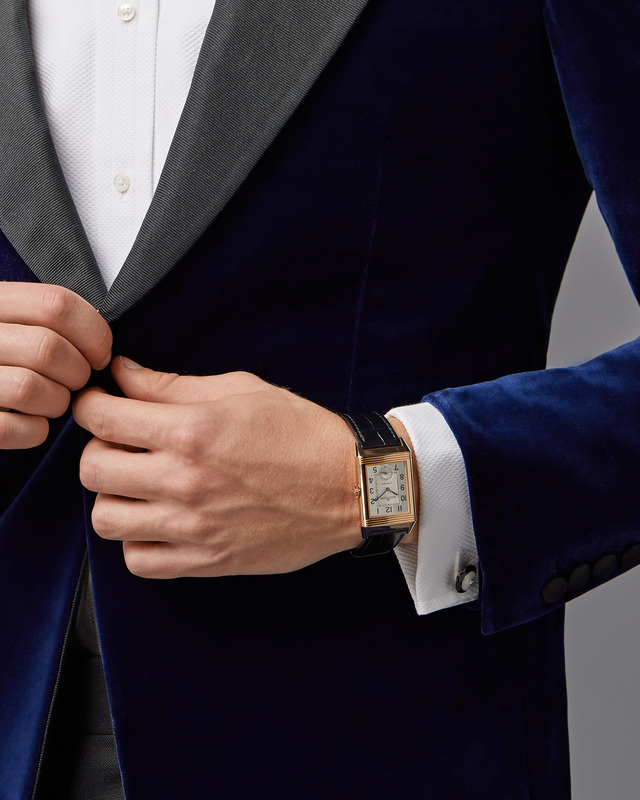 The choice of velvet also contributes to the contrast on show in this outfit: note the softness of the jacket next to the gloss of its satin lapels, the subtle ribbing of the cotton-piqué shirt and the metallic sheen of the watch. Kingsman also provides the tuxedo trousers, which are cut from a black barathea wool-blend fabric woven by William Halstead, a historic English textile manufacturer, and supplier to many of Savile Row’s most illustrious tailoring houses. Along with the shoes – a pair of glossy patent-leather Oxfords finished with ribbon laces made by George Cleverley of London’s Royal Arcade – they provide a solid set of foundations on which to build a formal evening wear outfit. The finishing touches? A silk bow tie from the Parisian couture house Lanvin and a pair of extravagantly bejewelled cufflinks from Trianon of New York, which feature gold, onyx, mother-of-pearl, and diamond. It’s almost enough to upstage the watch. View the Mr Porter Luxury Watch Guide Here. Does anyone even wear a tux anymore? Archibald Chesterfield III wears a tux with his prized Reverso. If so, I am sure they would look better than the illustrations – which also make the Reverso look ridiculous: a difficult feat to achieve. He definitely would be better served by getting a Casio. JLC is a good fit for an older dude, if I were younger I’d rather rock that new 5000-series steel square. There’s nothing worse than wearing a big diver/chronograph on rubber strap with formal attire. I love the reverso in almost every iteration but would be very happy with the chocolate/burgundy dial ref. 2782560. It would be pretty painful. I wouldn’t. A proper tuxedonis an investment in style and should be wearable for more than a decade. I actually agree with the tone of the article, but that was pretty humorous. I have a bespoke tux in my closet, have not worn it in almost 18 months but I know I could wear it tomorrow because it is in a largely timeless style (I dont know that I actually believe in truly timeless style, but mine is just boring old wool). I have no intentions on pairing it with a reverso thoug. That watch has never really spoken to me and it wouldn’t make a top 20 list of dress watches on my card. Interesting article: new series? 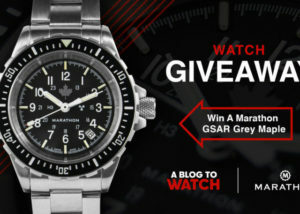 I like the idea, although helping someone pair an iconic ‘dress’ watch with a nice tuxedo is low hanging fruit. More people need help properly pairing the right watches and accessories with semi and business casual attire, I see way more ‘crimes’ in that segment. Hopefully we can see more of the Mad Hungarian’s crazy shirts. I would love to have the Reverso classic to wear with mine. As it is I wear my late fathers 1960’s gold Certina dress watch and it looks fantastic. I guess I am traditional. The jacket is in poor taste for a black tie event. I am also disturbed by the short inseam fad as of late. The ankle should never show when standing. Just my opinion. I agree in essence, although to my eye that is a far lesser crime than having too much pant on the shoe. Trousers should reach the second lace hole of your shoe. It is a beautiful watch, but this glamour shoot makes me want it less. 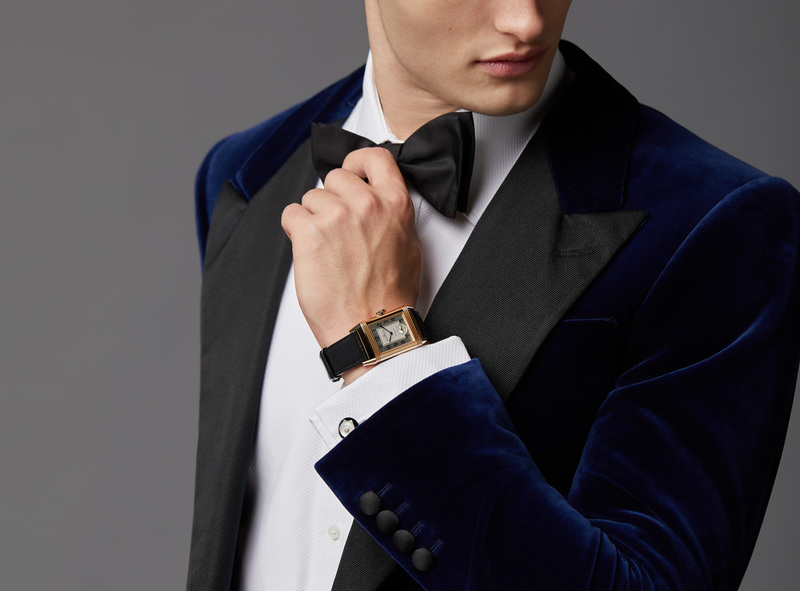 The watch is a very expensive accessory to go with your blue velvet tuxedo? 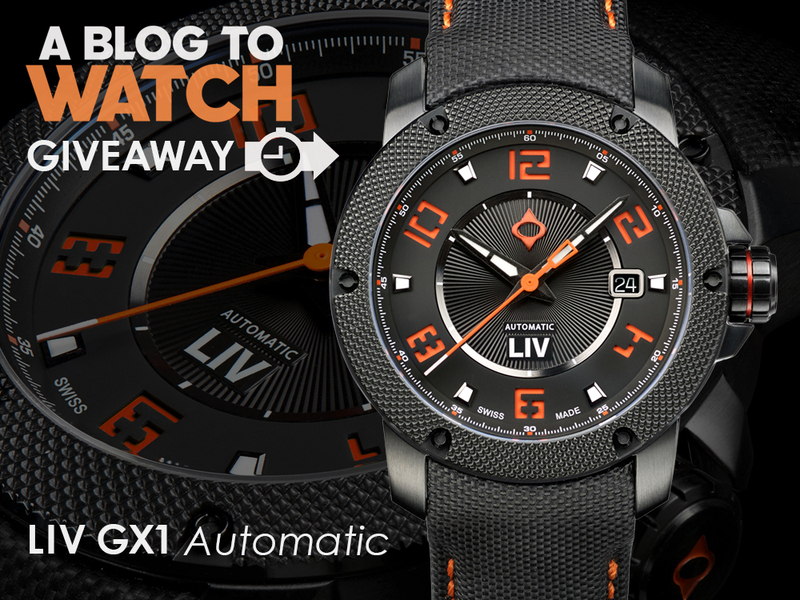 I’d rather see how this watch might integrate into someone’s wardrobe – show it’s versatility. And whatever happened to the rule of not wearing watches with tuxes? a watch designed to play tennis, in the Thirties. “Perkins can you tell Lady Cholmondaly-Singen-Inbred to change. The Bishop is coming for supper. Oh. And can you light the fire in the second library we’ll retire for port and cigars there. A Tuxedo…on a 6’6″, 340 lb giant sized guy like me??? OMG….. I don’t think so. If I can’t wear some khakis, & a blue dress shirt with my blue blazer…. I am staying home !!! I used to have several very nice suits when I was showing my Bichon Frise…but…Hurricane Katrina took care of that back in 2005. I haven’t bothered getting anything else but the Blazer… I don’t need it anymore. Katrina took your Bichon Frise? I’m so sorry. No the suits! but they guy hasnt had a need to wear a suit even once in 13 years since Hurricane Katrina. Wow! Without Marius here constantly telling me how iconic and amazing the Reverso is, I have no interest in them. The cushion shaped Casio has a nice case. I take it these would be quartz? And what happened to the notion that you dont wear a watch with a tuxedo?! Put your shoes on when buying trousers. And also put on your trousers when buying shoes.